Despite his enduring fame and violent nickname, Machine Gun Kelly never killed anyone, and he was never known to fire his namesake tommy gun (a gift from his wife) at anything but tin cans. As a young man he worked as a cab driver and bootlegger, and he was jailed for that crime at Leavenworth, where he became friends with several notorious bank robbers. He joined them in that line of work after his release from prison, and he was involved in numerous hold-ups in Iowa, Minnesota, Mississippi, Texas, and Washington. In 1932, with his wife and several associates, Kelly kidnapped Howard Woolverton, a banker in South Bend, Indiana, demanding $50,000 in ransom. Released after two days, unharmed and with only the promise of payment, Woolverton said that over subsequent months he received several phone calls demanding the past-due ransom, but he just hung up, and eventually his kidnappers stopped calling. On 22 July 1933, Kelly and his gang kidnapped Oklahoma oilman Charles F. Urschel, who was held for nine days before being released when a $200,000 ransom was paid. Though Urschel had been blindfolded through the entire ordeal, he had listened carefully to his captors' conversations, and he was able to provide numerous clues to FBI investigators, leading to Kelly's arrest only two months after the crime. Kelly and his wife were sentenced to life in prison, and during his years at Alcatraz and Leavenworth Kelly became pen pals with his victim, Urschel. Kathryn Kelly's sentence was commuted in 1958, four years after her husband's death. 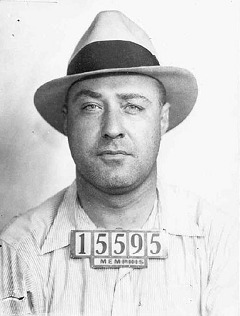 Some sources credit Kelly with coining the term "G-men" for government agents — when he was arrested in Memphis on 26 September 1933 he was said to have raised his hands in the air and said, "Don't shoot, G-men". Witnesses, however, suggested that this was a tall tale created by reporters or FBI Director J. Edgar Hoover, and though the phrase became commonplace afterwards, it had been in the vernacular for at least several years prior to Kelly's capture.